Ever since I got to review Out of the Darkness by A Sound of Thunder and conducted an interview with the band, I have been a fan and actually stayed in touch, at least once in a while. So if some will accuse me for shamelessly plugging the band’s subsequent efforts, Queen of Hell EP and now new full-length Time’s Arrow, I guess the accusation is well founded, but the product is full worth it. If I could characterize how I feel about A Sound of Thunder in one sentence, the band is not reinventing the wheel playing classic heavy metal style, but in the process they create a diverse collection of refreshingly good songs and that warms my heart. I am glad to report hereby that Time’s Arrow is no exception. With over an hour of music, compositions long and short, I anticipate different people liking different songs on Time’s Arrow. It is probably a testament of the individual cuts not only standing strong on their own but the overall album flow, however, that I tend to stick longer with Time’s Arrow as a whole than I did with Out of the Darkness (whenever that album is popped in the fingers dial Calat Alhambra first, before getting on with the rest of it). One of the reasons for that, I think, Time’s Arrow is more diverse. At the same time the album presents a pair of straightforward table setting rolling-down-the-street biker rockers, Power Play and Let’s Start the Fire, it has more sprawling, epic and soaring pieces like previously praised Queen of Hell and the closer Reign of the Hawklords. 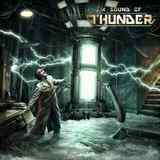 A Sound of Thunder has an innate ability to combine mystery with powerful romp. The title track is a prime example, where mid-song atmospherics are sandwiched between rejuvenated Iced Earth gallop and obligatory hooky chorus. Wastelands blends another catchy melody with somewhat progressive elements. End of the Road starts out in a ripping bluesy fashion, proceeds with guitars reminding me of Seventh Star era Black Sabbath only to close with a powerful finish (the band are big fans so they won't mind the comparison). I Will Not Break is rebellious stumping anthem proclamation, which I think will go over very well live, despite its somewhat quirky rhythm. Even the album’s ballad I’ll Walk With You is non-linear, the story of what I think is modern Bonnie and Clyde, oscillating between tender acoustics and emotional lament. With a set of songs like this, it is possible the songs won’t have universal appeal, but the quality presented will demand universal respect. I am not a musician myself, but it feels to me the band progressed further from Out of the Darkness. The guitars on A Sound of Thunder have always been quality, but now they are meticulous, the drums are powerful, yet I especially wanted to emphasize the new-found active bass. Tracks like Power Play, I Will Not Break, My Disease and End of the Road demonstrate this fact particularly well. Nina Osegueda still helms the vocals, and classic metal fans won’t be able to deny themselves the pleasure of comparing her high clean voice to the legendary Doro. Nina attempts to stretch herself further than before, taking some very high notes on Queen of Hell, but at the same time I am glad she can sing with power and in lower register when the song calls for it (Broken Bridge). Even though I would prefer even more power in that region of Nina’s voice, I have to say that in her duet with Blaze Bailey on My Disease she totally outshines her famous partner. He sounds a little tired, so Nina stands head and shoulders above Blaze. Time’s Arrow is another solid piece to A Sound of Thunder discography and another validation in my book why my original instincts hearing Out of the Darkness were right.